As we close this week, let me take this opportunity to express my personal sympathy to the families that lost their loved ones in Uganda in a landslide and those Kenyans that grieved for their dear ones in two road accidents that claimed 36 souls in just two days. Whereas the Uganda tragedy was a natural calamity that we mortals could not have avoided, the Kenyan situation was different. Yet both caused us to lose our loved ones. The personal loss at the family level will take a long time to forget; the wounds even decades to heal. All I can say is that it must have been the will of God and the best we can do is to support these families to come to terms with their tragedies. As we mourn our brothers and sisters in Kenya and Uganda, news coming from Libya about atrocities and excesses of the Gaddafi family were most disturbing but not surprising. Apart from mutilated dead bodies found in his family’s palatial homes, the tortured body of a mere house maid, a little girl burnt with hot water, chained in a room and left to die in eternal pain as they fled was as shocking as it was inhuman and disgusting. The question that must linger in the minds of those of us who watched the news footage was this: What on earth was this little girl’s crime to have deserved such cruelty and physical pain at the hands of her masters? For the 42 years that Muammar Gaddafi ruled Libya, I knew Libya to be a dry state, a good Muslim country that did not tolerate alcohol and drugs. How on earth did Gaddafi’s children stockpile such huge amounts of alcohol under their father’s nose, in their father’s kingdom without anybody raising a finger? Or was the strongman’s family exempted from such restrictions? Wherever Gaddafi may be now; this is the one question that he must be subjected to when he finally meets his Allah because the Allah I know has no time for hypocrites, liars and fraudsters. As I write this article, it is now obvious that Gaddafi’s family members are no longer in Libya. The rebels he once called rats have scattered them to the four corners of the earth. While some have shown up in Algiers next door in the North, others are presumed killed in battle while their father is finally calling for a truce while he is probably hiding in a hole Saddam Hussein style somewhere in the Libyan Desert. 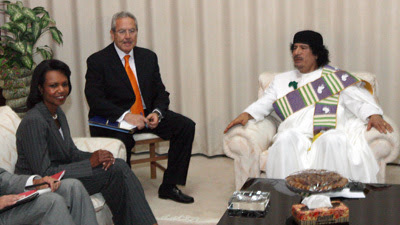 While it is obvious that the rebels have run the Gaddafi royalty out of Libya, it is curious that the African Union, the body of African Heads of State that he once led are still dithering wasting the time of the international community. They are reluctant to recognize the new leaders claiming that the rebels killed African mercenaries that fought alongside Muammar Gaddafi! Surely, if you offer to lay down your life for a few dollars in a foreign land and lose your life to the enemy, you only have yourself to blame. As at the end of this week, only about 20 African heads of state had recognized the rebels as the true leaders of Libya, more that 50% were still holding out adopting a wait- and- see strategy. What this undecided group has missed is that the day the NATO Alliance moved in to give the rebels “cover”; the entire Western Alliance had recognized the rebels. These are the states with fire power to bomb any country to smithereens then lead the reconstruction thereafter. If you doubt me, ask the Koreans, Japanese, Germans, Iraqis and Afghanistans. It always follows a known pattern; go in, get out the devil, flash out his supporters and deal with collateral damage later. Perhaps it is time we Africans questioned the very existence and usefulness of the AU in Addis Ababa. When an African dictator butchers his people, they turn a blind eye and give that dictator tacit support. We have seen examples of this behavior in the AU’s handling of Darfur crisis where to this day Omar El Bashir still murders at will and gets the protection of the AU. The other day, the AU Secretariat called a meeting of Heads of State to raise funds for the famine disaster in the Horn of Africa. It was embarrassing to see a no show situation in Addis Ababa. Even Prime Minister Meles Menawi’s best soul mates across the continent failed to turn up. Yet when it was the turn of El Bashir to be arraigned in court at the ICC for the murder of innocent Darfurians or the Ocampo Six of Kenya to go to The Hague, it was a houseful in Addis Ababa and the continent spoke with one voice to condemn the ICC as a colonial court! But the hypocrisy of the African leaders knows no bounds. Of the first 18 leaders to recognize the rebels in Libya, were some of the poorest states that fed on Gaddafi’s generosity when he was in power. President Jameh of The Gambia was not embarrassed to be among the first African dictators to condemn Gaddafi when in 2006; Gaddafi single-handedly sponsored the AU summit in Banjul for the cash-strapped Jameh! Now that the ICC has opened a file on Gaddafi with the intention of prosecuting him and his generals, will the AU stand in the way again at the expense of that little girl- that maid I saw on TV? I leave it to you the reader of this column to decide. Raphael Tuju is no ordinary Kenyan. He is not a village idiot either. He was one of the better known cabinet ministers who lost out in the bitter struggle for power between PNU and ODM in 2007. Coming from Nyanza, the stronghold of ODM then as now; and based on the fact that he was the only senior minister to have pitched for PNU in Luo Nyanza, it would have been a miracle if he had survived the Raila Odinga election machine. However, there was a slim chance that he could have parted ways with Raila Odinga and still gotten elected in that part of Kenya. MPs James Orengo of Ugenya and Joe Donde of Gem had done that in the past. However, between Orengo and Donde, it was Orengo who went out flat in 1997 to recapture his Ugenya seat on a Ford Kenya ticket despite the NDP onslaught then. Donde on the other hand had the fortune of going almost unopposed when the NDP candidate failed to present his nomination papers on time. Under the circumstances, Raila Odinga chose to back Donde even though he was a Ford Kenya candidate. His driving objective then was to lock KANU out of Luo Nyanza since his friend the late Oki Ooko Ombaka had declined to defend his seat due to ill health. Failing to back Donde would have meant the seat going back to KANU through Mama Grace Ogot. Raphael Tuju’s entry into the arena of presidential candidates may mean many things to many people. Some may see him as a spoiler for Raila Odinga especially for those who come from Luoland. And one can understand the yearning desire for Luos to finally produce a president of this republic, a post that has eluded them since 1962 when Jaramogi Oginga Odinga, Raila’s father could have easily assumed the presidency while Jomo Kenyatta was still in detention. 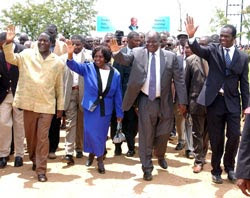 That missed opportunity by two Luo politicians T J Mboya and Jaramogi Oginga Odinga was to haunt the community for almost half a century when the quest became more difficult after the political playground ceased to be level. Kenyatta’s 15 years of reign was nothing short of autocracy. Within the first 24 months of his rule, Kenyatta quickly consolidated power and became ruthless with any person that imagined either sharing power with him or dislodging him through a democratic process. Anybody doubting Kenyatta’s resolve to rule unchallenged must ask what happened to Bildad Kaggia, Achieng’ Oneko, Kungu Karumba, Fred Kubai, Pio Gama Pinto, Jaramogi Oginga Odinga, Tom Mboya, Joseph Murumbi and JM Kariuki. Those who didn’t lose their lives like Pinto, Mboya and JM were either detained from time to time like Jaramogi, Achieng’ Oneko, Marie Seroney, and Martin Shikuku or were simply shunted aside like Joseph Murumbi, Bildad Kaggia and Fred Kubai. Whatever others may think, the fact that the Luos have never produced a president in Kenya’s 50 years despite being the most politicized community is definitely a factor in Kenya politics. It is what drove Jaramogi to establish himself as the doyen of opposition politics during the reigns of Jomo Kenyatta and Daniel arap Moi when KANU ruled supreme. At that time competitive politics irritated the political class and whoever dreamt of offering alternative politics was considered a dissident and at worse, an enemy of the state. If Jaramogi chose to seek the presidency in his twilight years in 1992, Raila Odinga joining the race in 1997 after the demise of his father and James Orengo having a stab at the presidency in 2002, it was the quest for this lost opportunity way back in 1961 when it was there for Jaramogi on a silver platter that drove them to run for the highest office on the land. However, by a twist of fate, it had to be one of Kenyatta’s tribesmen that put the spanners in the works, split the FORD party, formed FORD Asili and finally split the opposition votes leaving the field wide open for Daniel arap Moi to romp home in victory albeit with a slim majority. Jaramogi garnered a paltry 900,000 votes in that election. Ten years later, it had to be Jaramogi’s son Raila Odinga who confounded friend and foe alike when out of the blues, he declared Kibaki tosha for president in 2002, a government he only served for only two and a half years before Kibaki kicked him out just like Jomo had done to his father Jaramogi 38 years earlier. When in 2007, Raila Odinga chose to contest against Kibaki, he garnered support from the unlikely quarters- the very Kalenjins he had thrown out of power just five years earlier. The Kalenjins had calculated that he was their best bet to reclaim the power they had lost; after all he had worked with them briefly between 1998 and 2002 during the KANU-NDP cooperation. Now that Raphael Tuju has joined the presidential race, could the fear of Raila presidency- Railaphobia be at play here? Are there other forces in the political class that may be planning to mollify the Luos by giving them their lifetime dream- the presidency as long as that person is not Raila Amolo Odinga? Is Ralph Tuju attractive enough to other communities to make him beat any other contender including Raila Odinga and become Kenya’s fourth president? In other words, can Kikuyus, Kalenjins, Luhyas, Embus, Merus, Maasais, Mijikendas, Kisiis and Kurias vote for him even if Luos reject him? Whatever it is that has driven Raphael Tuju to resign his lucrative post in Harambee House and declare his candidature 12 months ahead of the next elections cannot be taken for granted, wished away or laughed off. Tuju is nobody’s fool. There must be something that only he knows that we don’t know. Whatever it is that is driving Raphael Tuju, we can only hope that time will tell. TRIPOLI (AFP) - Libya's rebels were on Tuesday seeking the return from Algeria of Moamer Kadhafi's wife and three children, while hunting down the longtime Libyan strongman and closing in on his hometown Sirte. "We'd like those persons to come back," rebels' spokesman Mahmud Shammam said after Algiers on Monday announced that Kadhafi's wife Safiya, two sons, a daughter and their children, had crossed the border into the country. So far Algeria has not recognised the NTC and has adopted a stance of strict neutrality on the Libyan conflict, leading some among the rebels to accuse it of supporting the Kadhafi regime. "The wife of Moamer Kadhafi, Safiya, his daughter Aisha, and sons Hannibal and Mohammed, accompanied by their children, entered Algeria at 8:45 am (0745 GMT) through the Algeria-Libyan border," the Algerian foreign ministry said in a statement carried by the state APS news agency, giving no information on the whereabouts of Kadhafi himself. The ministry said that UN chief Ban Ki-moon, the Security Council and number two leader of the rebels' National Transitional Council (NTC), Mahmud Jibril, had been informed. Responding, spokesman Shammam said Algeria had given Kadhafi's family members "a pass" to enter a third country. 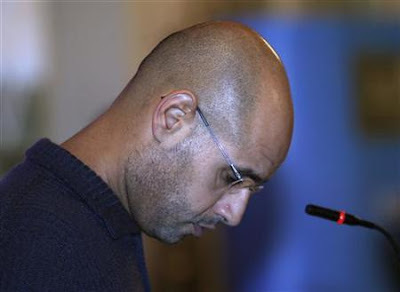 "Saving Kadhafi's family is not an act we welcome and understand," he told a press conference in Tripoli late on Monday. "We can assure our neighbours that we want better relations with them ... but we are determined to arrest and try the Kadhafi family and Kadhafi himself," Shammam went on, saying the rebels guaranteed a "fair trial." Italian news agency ANSA, citing "authoritative Libyan diplomatic sources," said Kadhafi and his sons Saadi and Seif al-Islam were holed-up in the town of Bani Walid, south of the capital Tripoli. Rebel Libyan justice minister Mohammed al-Allagy told AFP that Kadhafi's youngest son Khamis, whose death has been announced several times since Libya's conflict erupted but never confirmed, may have been killed south of Tripoli and buried on Monday. Khamis, 28, commanded a brigade seen as the most effective and loyal force of the Libyan leader. Rebel chief Mustafa Abdel Jalil urged the international coalition to continue its action against the strongman. "Kadhafi's defiance of the coalition forces still poses a danger, not only for Libya but for the world. That is why we are calling for the coalition to continue its support," Abdel Jalil said at a meeting in Doha of chiefs of staff of countries taking part in military action in Libya. The international coalition began Operation Unified Protector on March 19 under a UN mandate which authorised air strikes to protect civilians. Since March 31, the air strikes have been carried out under NATO command. Coalition military chiefs said in a joint statement that the war in Libya "is yet to end" and that "there is a need to continue the joint action until the Libyan people achieve their goal by eliminating the remnants of Kadhafi." The White House said it did not know Kadhafi's whereabouts but had no indication he had left Libya. There had been speculation that he was among tribal supporters in his hometown Sirte, 360 kilometres (225 miles) east of Tripoli, where rebel forces were gradually advancing upon. Rebels had moved to within 30 kilometres (20 miles) of the town from the west and captured Bin Jawad 100 kilometres (60 miles) to the east, the rebel commander in Misrata, Mohammed al-Fortiya, told AFP on Sunday. On Monday, the rebels seized the desert hamlet of Nofilia just inland from the coastal road east of Sirte, an AFP correspondent reported. The worth of your parent's is a big decider of your future. "Tomorrow, God willing, we will continue our advance. Their morale is rock bottom," the commander said. The rebels' deputy commander in chief, General Suleyman Mahmud, said talks were still going on with civic and tribal leaders to try to broker Sirte's peaceful surrender. The rebels have offered a $1.7 million dollar reward for Kadhafi's capture, dead or alive. Fierce fighting also raged in the west as rebels trying to mop up resistance by loyalist forces said they were ambushed southwest of Zuwarah. A rights group said on Tuesday that Kadhafi's forces used civilians as human shields, attacked ambulances and raped girls as young as 14 during the siege of the rebel-held western city of Misrata. 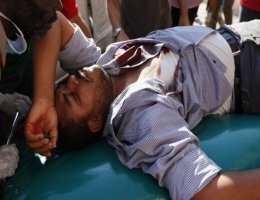 The allegations come from a report released in Washington by the US-based Physicians for Human Rights based on interviews with 54 people in the port city in June, shortly after rebels drove Kadhafi's forces out following months of heavy fighting. The report cited four witnesses as saying that Kadhafi loyalists detained 107 civilians and forced them to guard munitions from NATO bombing raids, including two children forced to sit on a tank. It cited one witness as saying that Kadhafi's forces had turned an elementary school into a detention facility where they raped women and girls as young as 14, and said it had documented honor killings of some of the victims. By Tariq M M K Anter, Mr.
Man receives in greedy ways but God receives in lovely ways. This is a portion of the speech that President John F. Kennedy gave at the Waldorf-Astoria Hotel on April 27, 1961. "The President and the Press" before the American Newspaper Publishers Association. John F. Kennedy seemed to be trying to restore the country to it's former self, not being manipulated by big business and big financial institutions. JFK's words sound prophetic in today's world. A world in crisis, economically, ecologically and ethically. In this world, maybe it doesn't seem so farfetched that secret, corrupt societies want to keep the people ignorant and divided while they can profit from the poor. The website where it was located and downloaded the entire speech 13MB and was also able to obtain and print the text transcript is at: http://www.jfklibrary.org/Asset-Viewer/BqXIEM9F4024ntFl7SVAjA.aspx?gclid=CKqf1Yj6yqkCFQQ7gwod1y0bLw. BEWARE: “The high office of President has been used to foment a plot to destroy the American's freedom, and before I leave office I must inform the citizen of his plight” Is a dubious quote attributed to JFK 10 days before his assassination. 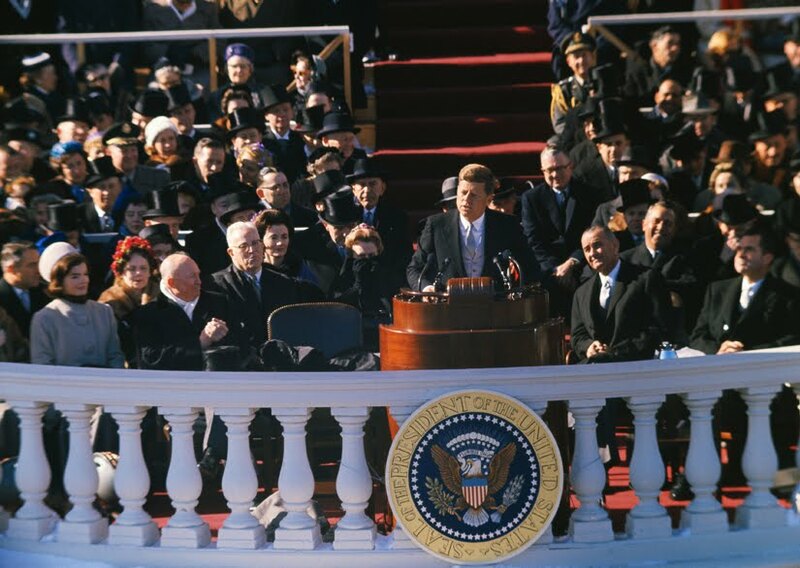 This video contains one of the most awesome, inspiring and truthful speeches ever given by a president. This very speech must have caused a lot of panic among the higher echelons of the elite. Kennedy had been in office for only 3 months and he was already taking unprecedented steps to empower ordinary people. Kennedy did more for civil rights than any other president since Abraham Lincoln. Kennedy was a big supporter of the constitution, he was against the tyranny of big government. He wanted to withdraw US troops from Vietnam. He wanted to abolish the CIA and Federal Reserve, and he warned us of criminal elements within the establishment who wanted to cease an opportunity to restrict peoples freedoms. He urged the press to be more open and to fulfill its obligation to inform the American people about pertinent facts. And on top of that he spoke openly and candidly about the dangers of secret societies and their influence over the way government works. So is it any wonder that he was dramatically silenced only two years after making this epic speech? In my efforts to provide you a transcript of the attached file, I have discovered that the above paragraph is word for word the first 1:26. "No President should fear public scrutiny of his program. For from that scrutiny comes understanding; and from that understanding comes support or opposition. And both are necessary. I am not asking your newspapers to support the Administration, but I am asking your help in the tremendous task of informing and alerting the American people. For I have complete confidence in the response and dedication of our citizens whenever they are fully informed. I not only could not stifle controversy among your readers-- I welcome it. This Administration intends to be candid about its errors; for as a wise man once said: "An error does not become a mistake until you refuse to correct it." We intend to accept full responsibility for our errors; and we expect you to point them out when we miss them. Without debate, without criticism, no Administration and no country can succeed-- and no republic can survive. That is why the Athenian lawmaker Solon decreed it a crime for any citizen to shrink from controversy. And that is why our press was protected by the First (emphasized) Amendment-- the only business in America specifically protected by the Constitution-- not primarily to amuse and entertain, not to emphasize the trivial and sentimental, not to simply "give the public what it wants"--but to inform, to arouse, to reflect, to state our dangers and our opportunities, to indicate our crises and our choices, to lead, mold educate and sometimes even anger public opinion. This means greater coverage and analysis of international news-- for it is no longer far away and foreign but close at hand and local. It means greater attention to improved understanding of the news as well as improved transmission. And it means, finally, that government at all levels, must meet its obligation to provide you with the fullest possible information outside the narrowest limits of national security..."
These are the main parts of JFK's speech, where he warns us about the dangers of secret societies. It seems that Kennedy wanted to blow the whistle when he found out about the true scale of corruption within the establishment and how freemasonry and other secret societies play an integral part in this corrupt agenda. It also seems that Kennedy wanted to speak out about the closed and secretive nature of organisations like the freemasons, especially at the higher levels. And it is only when a freemason reaches the higher levels that he can gain a fuller understanding of the kind of organisation he is part of. Freemasonry also has its own set of rules, oaths, allegiances and rituals that are considered higher in importance than the ordinary code of conduct that we ordinary people live by. And the higher up you go in freemasonry, the more strange and daring the initiation rituals become; this is a hallmark of the way criminal gangs operate. Remember, just because someone wears a suit and a tie, that doesnt necessarily make them a better person than the mugger in the alley with the baseball bat. I find it very curious that some people compare Obama with Kennedy, as if they are both one and the same. But you only have to look at the people that Obama has recruited to work alongside him to realise where he's coming from. Employing Zbigniew Brzezinski as his Chief Foreign Policy advisor is just one example. Then on top of that, Obama admits to being a globalist and he has publically admitted to attending a CFR meeting where he gave a speech. But what makes me feel most uncomfortable is the way that Obama stuttered and lied about the significance of his speech at the CFR. When question about his CFR involvement, Obama said: "I dont know if I'm an official member." - He wants us to believe that the CFR would allow someone to attend their meeting and give a speech, and yet not even discuss the issue of membership. You're either a member of something or you're not, so the word "official" is an irrelevant filler word. If he doesn't know that he's a member then that could only mean that he is not a member - in which case, why didn't he just say: "I am not a member, although I did speak there once?" Why not just be open and honest about it instead of stuttering and lying in an attempt to downplay the significance of it? This explains in someway what Obama meant by saying that Africa doesn't need strong leaders; but rather strong institutions!!!! I hope that your medical treatment, in the USA, is having positive results, on your health. I am optimistic that you will overcome the hardships, and come back to resume your normal, daily, human activities, in East Africa. We have never met each other, nor corresponded with other, before. Suffice to inform you that I read your Columnist Articles in the Uganda New Vision Newspaper ( Online ). In your last Saturday Article, you mentioned about the American President's arrogance , namely Bill Clinton, while visiting Nigeria and Arusha, in Tanzania . 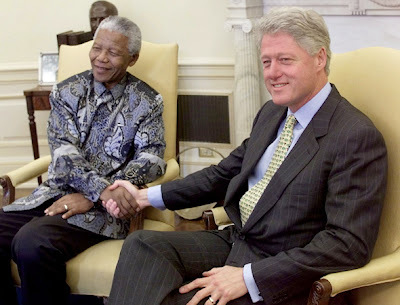 Just for your information, President Bill Clinton went to Arusha, to witness the Peace Agreement between the warring factions in Burundi, which had been put together by President Nelson Mandela, of South Africa. Clinton desired to have the opportunity to be seen, in the USA, and International Press Media, with Mandela, witnessing the Burundi Peace Agreement, in Arusha . Just before Bill Clinto arrived in Arusha, " ...every hotel within a radius of 100 miles radius of the Arusha town, was booked for the President, and his entourage .., and the Secret Service cut off all the Phones in Arusha town, except its own and, presumably, those of the presidential press entourage " . 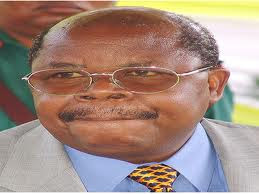 The US Secret Service agents removed Tanzania President Benjamin Mkapa from his limousine, and searched it, shaking him down, before allowing him to enter the venue where the signing was to take place . He entered alone ".
" His body guards were not allowed in. Nor was anyone allowed into or out of the venue once the Secret Service had locked it down " .
" Try to imagine a Tanzania security detail yanking an American president from his limousine outside the White House .." . ( Source : The Ultimate Road Trip. Adventure Capitalist, by Jim Rogers, 2004 Random House Trade Paperback Edition, pages 194, to 195 ). Finally, the forces bent on toppling the strongman of Libya have entered Tripoli. With two of his sons reportedly captured by rebels, it is only a matter of time before the rebels lay their hands on the strongman himself. Of all the regimes that have been toppled in Africa in the last three decades, perhaps Gaddafi’s was the most entrenched and most difficult to dislodge. Having ruled with an iron fist for 42 years that he deftly laced with charisma, arrogance and showmanship, Gaddafi became an unshakable institution unto himself. Gaddafi was Libya and Libya was Gaddafi. Libyan oil money was his personal wealth. With oil dollars in his pockets, he dazzled and mesmerized fellow heads of state in Africa making many of them literally eat from his palms. Time and time again, he bankrolled almost every AU summit in various capitals when the host country was cash strapped and could not bear the shame of hosting his peers. When Gaddafi landed in any African country be it South Africa, Ghana, the Gambia, Uganda or Sudan, the colonel was the man of the hour. His entry was always delayed for maximum effect. He would come in dressed in flowing robes befitting his pet dream of becoming the King of Kings. His entourage, consisting of well trained and armed female body guards was equally ruthless; no one dared stand in the King’s way. In a way King Gaddafi tried his best to imitate they way American presidents behave when they visit Third World countries. For the American presidential security detail, there is hardly any distinction between an African president and an ordinary public spectator. I saw it in Abuja when Clinton arrived there in 2000 on his first state visit soon after Obasanjo was elected the first civilian president in decades. The American Marines were so arrogant and intimidating such that the equally arrogant Nigerian security drew their guns warning that unless they backed down and played second fiddle in security arrangements then they were ready to call off the visit. The Americans backed down. While on the same trip; Clinton visited Tanzania and specifically Arusha. Why he did so I cannot remember but it must have been some peace memorandum between either warring Sudanese or belligerent Somalis. When he landed, a number of IGAD presidents had gathered to meet him. Some of them were not even allowed to get closer to him, let alone greet him. It was America’s arrogance or was it their insecurity at its best? A few years ago, I had the privilege to attend a number of AU meetings in Addis Ababa, Accra and Banjul. While in Banjul in 2006, Gaddafi arrived in a plane load full of white stretch limousines manufactured in America. These Limos were all offloaded in Senegal so that the King of Kings would snake his way in to the Gambian capital in style. As the convoy moved a long, he stopped at every village market and dished out petro dollars to poor Africans along the way. Meanwhile his team of bodyguards and publicity handlers had combed the city for security detail as they splashed the entire city with Gaddafi’s life-size portraits. Any tourist visiting Banjul at the time could be forgiven for thinking that Gaddafi was the Gambian head of state or better still, he was running for election in that country. I remember him making a grand entrance later in the day having missed the opening ceremony during the APRM forum when Rwanda and Kenya were being peer-reviewed. Instead of coming to sit in the hall, his aim was to attract media attention and disrupt the proceedings. No head of state raised a finger as far as I can remember. During the same summit, he refused occupy one of the villas he had built for visiting heads of state on behalf of the Gambian president. Instead, he chose open ground and pitched tent like the Bedouin that he was. The following year, he threw tantrums at the AU Accra Summit over the seating arrangement. He insisted that he must sit alone in an enclosed area, far away from any other head of state. When John Kufuor of Ghana declined to grant him his request, Gaddafi stormed out and went to address university students at one of Accra’s campuses. Gaddafi’s arrogance knew no limits. When his dream of forming the United States of Africa with him as the first Head of State failed, he hit the roof. This was despite having bribed many heads of state to vote in his favour. When he realized that fellow heads of state were not with him, he gathered traditional leaders across the continent, made them kings and forced them to declare him King of Kings! 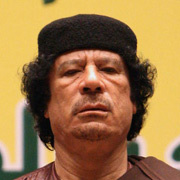 Of all fallen despots of the continent, Gaddafi’s fall must have been the most painful of them all for Gaddafi. His pomp and glory could not be matched by Emperor Bokassa, Ben Ali, Hosni Mubarak, Idi Amin, Joseph Mobutu and Sani Abacha before him. He was the mightiest of them all and when his time came, he surely fell from grace to grass. The question to ask is this: Will the King of kings allow his enemies to capture him and try him publicly like his comrade Hosni Mubarak of Egypt or Ben Ali of Tunisia? Or, will he commit suicide like Adolf Hitler? Only time will tell. The writer is a media consultant. A few months ago when I was first admitted at the M P Shah Hospital in Nairobi, I wrote an article about my condition that I thought was merely to alert my friends and let them know about what I was going through. In the article I talked about my first impressions of the hospital since I had never been there before. However, in talking about how I was treated by hospital staff, I had the hindsight of being able to compare what I saw with what I have gone through or seen at Nyanza General Hospital, Kenyatta National Hospital, Nairobi Hospital and the Aga Khan hospitals in Kisumu and Nairobi. Whereas I have never been admitted at Kenyatta National Hospital or Aga Khan Hospital in Kisumu, I have had the experience of visiting my relatives at both hospitals when they have gone to these two hospitals for treatment. Based on my observations, both hospitals are worlds apart. The Aga Khan Kisumu is a private hospital with fairly modern facilities and provides exceptional healthcare services to the people of the region. It was at the same hospital that my late parents were cared for until they passed on. The Kenyatta National Hospital on the other hand is a public facility with limited resources all round. Nothing is not in short supply here be it the staff, food, blankets, beds or medicine. The population streaming to this hospital on a 24 hour basis is simply overwhelming making it impossible to provide adequate and reasonable services to the sick and injured patients that go there. And with a high turnover of its Chief Executives and the majority of its doctors in private practice all over the town, it is understandable if medical and healthcare services have gone down considerably since independence. I’m told that when it was King George VI Hospital, it was the place to go to for medical treatment. Comparing medical services at public and private hospitals is like comparing cattle and donkeys. There can be nothing in common between them other than eating grass. One is a beast of burden while other provides milk and ghee before ending up at a dinner table. It is for this reason that I am 100% behind Prof. Peter Anyang’ Nyongo’ the Minister for Medical Services to get this country moving again towards universal healthcare insurance. 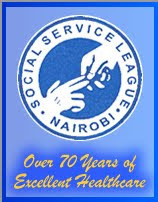 Yes, if patients admitted at Kenyatta National Hospital and other provincial hospitals would pay well for their services, public hospitals would generate enough cash to hire qualified hospital administrators, doctors and nurses, buy enough medicine, beds and bedding and feed their patients with food fit for human beings. This is not the case now and nobody is doing anything about it! As it is, patients at these public hospitals just survive their ailments by the grace of God. No wonder stranger preachers prey on their crowded beds giving them unsolicited blessings. After being discharged from M P Shah in May and spending seven weeks in the USA, I surely saw the difference between healthcare services we get here at home and those that are provided in developed countries. In the USA, the first thing that hits you is the sense of welcome by the hospital staff right from the Hospital reception desk. Nobody barks at you to demand what you want or meets you with a chilly “Can I help you” stare. However, on my second admission at the MP Shah Hospital this month, I found the same smiling and welcoming faces I had observed the first time round. This time it was even better because the hospital CEO arranged for my Emergency Admission even before I left my house; but because there was no bed immediately available, I was temporarily admitted at the ICU where I was attended to immediately without any bureaucratic procedures. Like all hospitals all over the world, doctors and nurses see thousands of patients such that it is unkind to expect them to remember their patients by name let alone their faces. However, the staff at MP Shah Hospital seem to have made it their business to remember the names of their patients. In my case they all call me Mr. Jerry! However, on my third and last day at the hospital two unique ladies paid me a surprise visit soon after breakfast on my hospital bed. They were Mrs. Maina the Chief Nurse and Mrs. Munyugi the Chief Matron. When they entered my room, the first thing they noticed was a laptop and burst out laughing! I kept wondering what was amusing these to senior ladies of the hospital. Then Mrs. Munyugi let the cat out of the bag! The two ladies had read my article in the Star in May and remembered word for word what I had written about. They were amused how I described their ambulance services that last time. As they stood laughing in my room, they noticed that my side of the wing was under construction making it impossible to open the windows. And they started imagining how I would describe the scenery this time, hammers, cement and all falling all over me! After they left, I kept thinking about them and wondered in which other hospital can patients find nurses and matrons with this sense of humour? How many nurses, matrons and doctors have the time to read newspapers like these two ladies; get the humour and talk about it months later? When they left my room, I felt blessed and much better that morning. It was like I had been visited by my guardian angels. Mrs. Maina and Mrs. Munyugi; keep laughing and smiling with your patients; it is the best care and medicine you can ever give to them and it costs you nothing! Thank you for caring for me and making my day! Today I want to reflect on Mr Miguna Miguna’s disgraceful exit from the public stage. It was long overdue. But I have one piece of advice for Mr Miguna — don’t attempt to go mano-a-mano with Prime Minister Raila Odinga. Accept your sacking with humility and move on. Remember the Chinese saying — the peacock that raises its head gets shot. A senior aide who loses his boss’s confidence must go without making a fuss. It’s unseemly to protest the sack too loudly. It betrays a problem of entitlement. Servants in the “king’s court” don’t have public minds of their own. Most advisers toil in darkness and don’t compete with their bosses for attention. Here’s why you got tossed. First, Mr Miguna forgot why he was useful to Mr Odinga. Presidential candidates — and Mr Odinga is one — must focus on winning elections. The candidate’s men and women must do everything to make him electable. Any aide or adviser who doesn’t understand this cardinal rule shouldn’t be around. The candidate’s electability is at the centre of everything. Nothing else matters. Aides must pour themselves body and soul into the candidate’s fortunes. This is true the world over. President Barack Obama’s advisers know this, or they’d be gone in a nanosecond. I believe that Mr Miguna forgot that his utility would end if his actions and words became counterproductive to Mr Odinga’s election chances. That’s why he had to go. A presidential campaign is like a choir, and the conductor is the candidate. This is especially true in Kenya where the candidate is more important than the party. No one else in the party — or in the employ of the candidate — is allowed to compete with the candidate for attention. Some will counter that Mr Miguna was a State official, not a party hack. I say baloney. He spent his waking and sleeping hours — at taxpayer expense — fighting ODM’s wars against PNU. Mr Miguna made no secret that he’d take a bullet for Mr Odinga. Therein lay his fatal mistake. He confused himself with Mr Odinga. That’s why he was accused of treating MPs like his subordinate underlings. Second, there can only be one lion king. If you doubt me, go see for yourself at the Maasai Mara. Parties must speak with one authoritative voice. That’s why Eldoret North MP William Ruto must leave ODM. There can’t be two rats in one hole, as an African proverb reminds us. Often, Mr Miguna publicly expressed views contrary to Mr Odinga’s and those of senior ODM MPs and party secretariat. In his column, he would disclaim that the views were his and not ODM’s or the PM’s. That’s nonsense in politics. Spokesmen, advisers and aides cannot contradict their bosses in public. Mr Miguna did so every day. Which begs the question — was he or Mr Odinga ODM’s ultimate voice? My view is that Mr Miguna grew too big for his breeches. He fancied himself ODM’s “thinker” and key ideologue. To him, many of the MPs in ODM were reactionary. He regarded the PM’s secretariat as anti-reform, lazy, and dim-witted. He would churn out many position briefs for the PM. Whether he was right or not isn’t the point. But he reportedly never tired of reminding them of their incompetence. However, Mr Miguna thought he was “untouchable” because he had Mr Odinga’s ear. That’s naive. The man made enemies everywhere — in ODM, among MPs, in the secretariat. That’s why they all combined forces for a take-down. Mr Odinga had to choose between Mr Miguna and ODM. Third, Mr Odinga finally realised that Mr Miguna was a liability. The man reminds one of a child bully in a sandbox. He labours mightily to use “big” words and phrases. This makes his writing look phony. What looks to some like intellectual arrogance is academic insecurity. Otherwise, there’s no reason to hurl insults at everybody who disagrees with you. Add the uncouth language to his dress — especially the hats — and a rather comical image emerges. He actually reminds me of the former Zairian dictator Mobutu Sese Seko Nkuku Ngbendu wa Zabanga. That’s a lot of pomp. Mr Odinga must have known that such a “comical image” conjures up bad African memories. That’s no way to woo discerning voters. Finally, Mr Odinga may have suspected that Mr Miguna was simply using his “zealotry” to serve as pretext to advance himself. Mr Odinga is in robust health. But I am sure many Luo politicians are scheming to succeed him. Who will inherit the enviable Odinga mantle when Jaramogi’s son retires from politics? Mr Miguna may have been positioning himself. But he’s not alone, except perhaps he was too indiscreet. Mr Odinga may have been convinced by others of this clever plot. No politician enjoys talk of succeeding him. You can think the thought — and even plan it — but don’t expose your left flank, or be obvious about it. Otherwise, decapitation could be swift and surgical. Those who say Mr Miguna fell because of “interfering” with the electoral commission are looking in the wrong place. Nor should they blame PNU. Mr Miguna’s fall is an internal ODM affair. He doesn’t fit in Mr Odinga’s 2012 electoral chessboard. He’s an embarrassing distraction and a loose cannon that is more likely to repel votes than attract them. He’s a glutton for public attention, which is a no-no for an aide. He was useful as a hard worker, but had too many downsides. I suspect the more established wing of ODM did him in. He should live to fight another day. To HENRY84: Use your head. Is Mutua employed by Raila? Mr. Otenga, procedure or no procedure, you cannot outshine your boss. What part of that don't you understand? That is one of the 48 laws of power. Miguna formed a parallel centre of power to the master and became an impediment to the overall objective, propping up the party, ODM and the maseter. He had to go. .........Spokesmen, advisers and aides cannot contradict their bosses in public. Which begs the QUESTION, mutua ''What are you in Railas'/ODM inner circle, because as I know you have never contrandicted him or ODM in public?? prof. why cant you throw caution to the wind, and say openly raila tosha.stop hinding behind you pen, or is it in usa! The procedure followed to fire him leaves a lot to be desired. I am 100% sure that this is one case Miguna is not going to loose! There's one thing I remember Miguna telling Raila and I thought it was true: The "50-50" power sharing deal was not actually 50-50! And thats why it did not have the toilets and red carpets. Raila should have listened! Diaspoliticians are not likely to be our saviour, it seems. Mutua, I am very disappointed in your article because it seems to be written out of malice. Miguna, was a civil servant and was fired without being according his due process rights. The comparison with the US white house is not honest and you know it. This is hypocricy of the highest order and coming from someone who ought to know better is rather disappointing. Yet again the Prof panders over anything that may remotely potray the PM in a bad light! While his analysis of the situation with MM may be correct, as a law don he should have addressed the procedural irregularities in the sacking but doing so would certainly push dung right into RAO's doorstep! Mr.Mutua,nice review of Miguna's woes,it seems you've been studying him for quite some time!Expect a reply from him and he'll definitely tear you raw! A wonderful peace Mutua. I love this, ''Those who say Mr Miguna fell because of “interfering” with the electoral commission are looking in the wrong place......... He doesn’t fit in Mr Odinga’s 2012 electoral chessboard''. Here you summarize the entire article and it shows your brilliance and academic prowess. Well done Prof. Very interesting and insightful. The beauty of education is being flexible and able to live with people, even those with divergent views. I only see a learned Mr Miguna but not educated! Good observation but it looks like most of your articles becomes irrelevant if you dont drag in the name William Ruto. Try writting about the positive side of this name since I know you will never miss. Sometimes it pay to tell a colleague the truth. The title of your message is revealing. You have analysed MM properly. Most of it is correct and in the public knowledge.But I disagree with your contention that his argument he was a civil servant albeit on contract is baloney. It's not nonsense. The man should have been eased out properly. I think the outcome of his suit in the HC will prove that. As for his dress and muslim caps, it's a personal choice. You will agree that even Raila often appear in dresses resembling those of band masters with only the wand missing. Right on, Prof. Miguna's exit was long overdue, and should be followed by secretary general's. These gentlemen (sic) forget to articulate and moderate ODM's positions to sympathy. then people shud not blame Sir Alfred Mutua for carrying out his duties if u agree with this article. Martha Karua got the same medication and she has learnt to live with it. 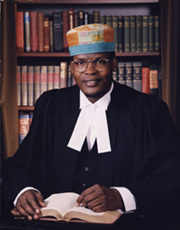 Miguna Miguna can always practice law or sell insurance. Wish him well!